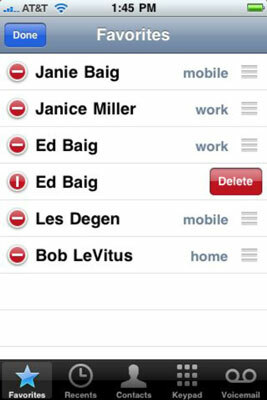 On your iPhone, you can keep a list of the people and numbers you dial most often in Favorites. Consider Favorites the iPhone equivalent of speed-dialing. Merely tap the person’s name in Favorites, and your iPhone calls the person. You can set up as many favorites as you need for a person. So, for example, you may create separate Favorites listings for your spouse’s office phone number and cell number. In the Phone app, tap Contacts. Your list of contacts appears. Tap the name of the person you want to add to Favorites. That person’s Contact screen appears, with a bunch of fields that contain the individual’s phone numbers, physical and e-mail addresses, and possibly even a mug shot. You may have to scroll down to see more contact info. Tap the Add to Favorites button. All the phone numbers you have for that person pop up. Tap the number you want to make into a favorite. That number turns up on the Favorites list. To access the Favorites list, just tap the Favorites icon in the bottom-left corner of the screen. Tap the Edit button in the upper-left corner of the screen. You’ll notice that a red circle with a horizontal white line appears to the left of each name in the list. Tap the circle next to the A-lister getting the heave-ho. The horizontal white line is now vertical, and a red Delete button appears to the right of the name. The person (or one of his or her given phone numbers) is no longer afforded the privilege of being in your iPhone inner circle. Tap Edit in the upper-left corner of the Favorites screen. To the right of the person you want to move, press your finger against the symbol that looks like three short horizontal lines stacked on top of one another. 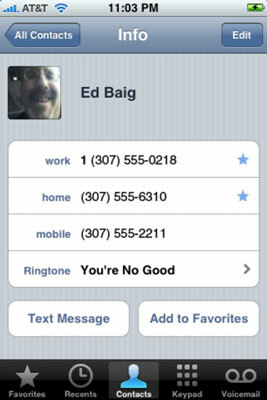 Drag that symbol to the place on the list where you want your favorite contact to appear. When you have the contact right where you want him or her, lift your finger from the screen. Tap Done when the listings are ordered the way you want them. You can designate new favorites from the Favorites feature by tapping the + symbol at the upper-right corner of the screen. Doing so brings you back to Contacts. From there, select the appropriate person and number. A star appears next to any contact’s number chosen as a favorite.